Recycling is good for Environment and for Business. 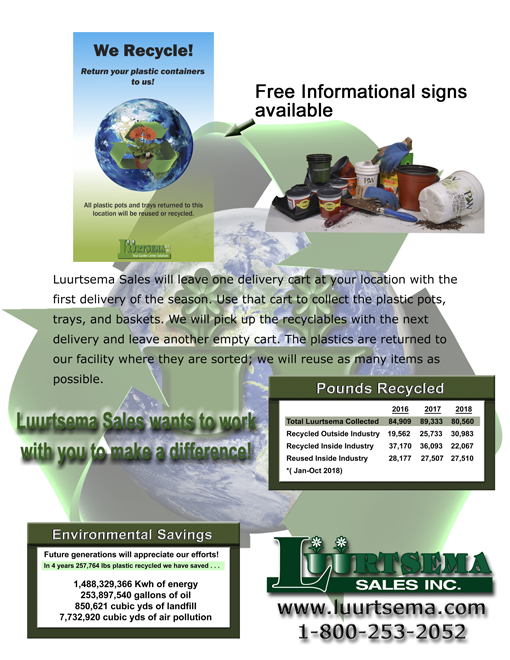 We make it easy by providing you a poster and cart to collect all the used plastic pots, and shuttle trays. By having your guests see you recycle will encourage them to do the same, and when they return with pots, you will have the opportunity to help them again! It’s a win win situation. You win with your staff because they has an easy place to go with all the plastic shuttle trays etc.. that take up needed room in the garden center and your dumpster. See how much this helps the environment and makes this earth a better place for the next generation! Request your FREE sign with your first order by listing it in the Notes section of your order form or email or call us!